I was glad to hear that South Carolina's state Senate and House both voted to remove the Confederate battle flag from the statehouse grounds and place it in a nearby museum. By the time you read this, the flag should be down. Some people decry this is removing or erasing their heritage. I say, go research your history. Some people complain that "no one was offended until liberals told you to be offended." I say, you haven't been paying attention. Some minimize it as a meaningless symbolic move. But symbols are important, and you have to start somewhere. As long as it doesn't end here, too. 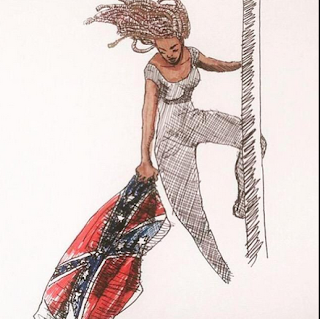 So I’mma say that the pole here – flagpole though it were – still marks a liminal space of possibility for what Black resistance beyond respectability looks like. Bree Newsome’s Black girl body climbed a pole, quoting scripture, to take down a flag that is emblematic of so much violence enacted on the Black body by the U.S. nation-state. Her act exploded every simple discourse we are currently having about what faith demands, about what decorum dictates that we should accept, about what are acceptable forms of resistance for (cis) Black women’s bodies. It's astonishing to me the number of people who are content to ignore our racist past and present, including slavery. "It was so long ago! Why can't we just move on?" Because history is important, and there are real and lasting effects from the past. We need to understand where we've been in order to chart a new course. Read Frederick Douglas's moving "What to the Slave Is the Fourth of July?" Here are some incredible recordings of interviews with former slaves telling their stories. I recently found this article at the Smithsonian showing rare pictures of African Americans on the Plains in the early 20th century. And as a great example of why it's important to know our history, here a woman who worked as a tour guide at a plantation explains some of her experiences answering (ignorant, often well-intentioned, but startlingly oblivious) questions about slavery to the guests. I'm a big fan of the Bechdel test for movies. Of course it doesn't mean that it's necessarily a good movie, or even a feminist one, if it passes the (very) low bar of have two named women characters who speak to each other about something other than a man, but it's a start, at least. On a related note, I discovered Every Single Word on tumblr. Dylan Marron has taken some popular movies and spiced together every word that a person of color says on screen. Not even to another person of color - just a single person of color speaking! And if you ever doubted how white Hollywood is, this will be a rude awakening. Of course, there are movies which have more diverse casts, but this is still a very visible issue and one that could be addressed by individuals in the industry if there was the desire, and if "white" stopped being seen as the default.